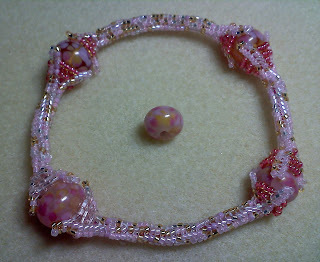 I did finally get a bracelet made for my friend, Teena. I used a seed bead mix of pinks that I got from Nancy Dale of Ned Beads and gorgeous lampwork beads from Janet MacDonald of Singingwoods. I'm pleased with the way it came out, too. But here's the sad thing. I have no where to send this! My lovely old friend has been flooded out of her house by the Susquehanna River, and the National Guard is not allowing people to return to their homes. And, once they do allow that, she cannot go near the place. Chemotherapy causes the immune system to be seriously compromised and a house full of mold and dirt and wet mildewing things is not for her! They are considering not returning at all. But just selling the land and moving. I can't say that I blame them! They managed to get the important stuff (family photos mostly) up to the 2nd floor, but the basement & first floor are full of water. I called her & asked if she was waiting for the plague of locusts and she was actually able to laugh. I'm not sure I would be if I were in her shoes. So here's her bracelet. I guess I'll just hold onto it for a little while. Sally, the bracelet is beautiful love the color combination. I know Teena will love it. What a tragedy that her home has been flooded. She seems to be a strong person and blessed to have a loving friend like you. It's beautiful Mom. I know Teena will love it. Been keeping her in my thoughts and prayers. Love you!! Oh sally it is so beautiful!! Thank you for mentioning and buying my Lampwork! Your work is lovely! 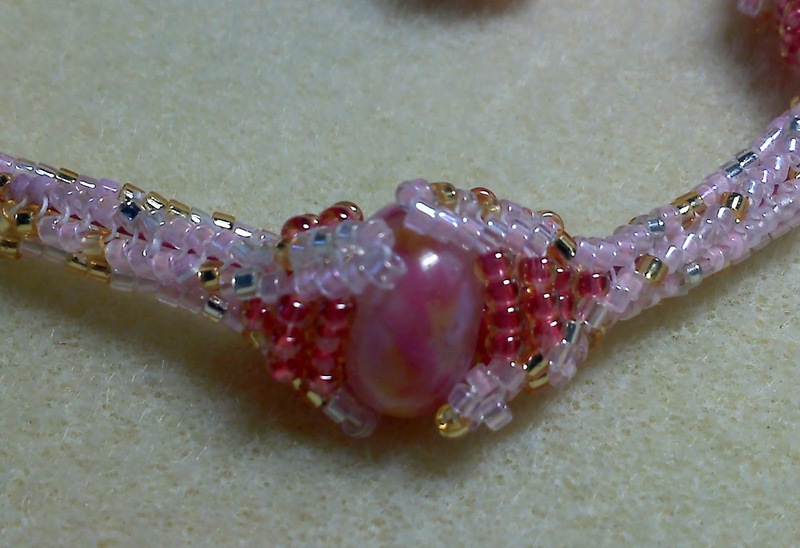 Wow you have the patience of a Saint doing fine beadwork. I so admire you guys who do it! I tried but have no patience. best be left to the talented ones like you! It's gorgeous Sally! I know Teena will love it, I wish she could have it now, I'm sure it would bring her great comfort. 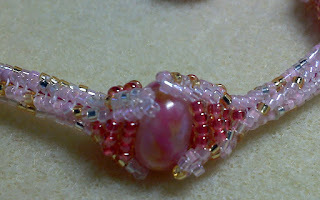 I love how you used the bead mix, Sally, and I'm in love with the lamp work -I will have to go check out that shop. I am sorry for your friend... my Dad got flooded out as well, and I know how stressful this is for her. Best wishes to her, and my thanks to you! !